The dwindling but still determined protesters in Hong Kong now face a vicious media assault on everything they stand for by central party propagandists in Beijing, writes John Keane. 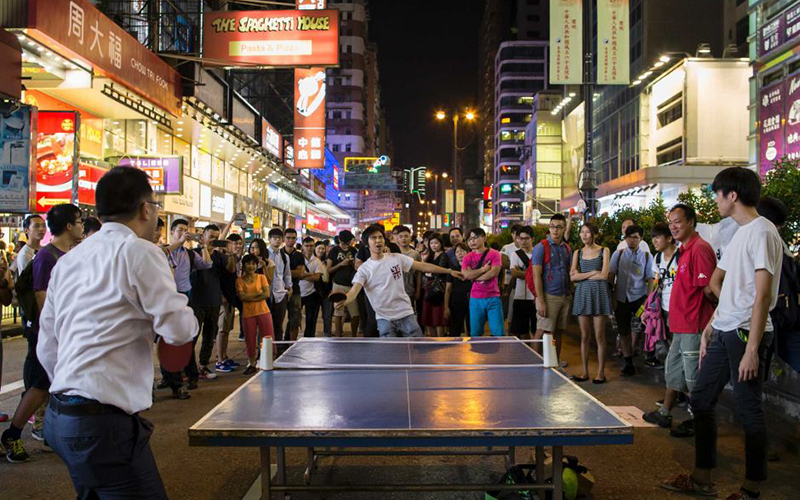 Now entering its third week, its numbers dwindling but its determination and purpose still remarkably strong, the umbrella uprising in Hong Kong has shown its playful side, by bringing ping-pong to the city streets. Not everybody is impressed. Several days ago, at the Mong Kok protest site, an angry citizen caused a commotion, blaming protesters for having too much fun. The man said he was outraged by the now-viral photos of people eating hotpot and playing ping-pong on the streets. A crowd quickly gathered, as the misery guts complained loudly about the transformation of Hong Kong’s thoroughfares into a playground. After protesters appealed to him to calm down, police officers led the man away. There were no reported arrests. As a gesture of respect for their fellow citizens, the ping-pong table was soon removed by protesters, leaving them to concentrate on a much deadlier game: a vicious media assault on everything they stand for by ping-pong propagandists in Beijing. Last weekend’s open letter to Xi Jinping from representatives of the umbrella movement is an appeal for open dialogue with the ruling powers, whose media attack on Hong Kong appears to grow nastier by the day. “The West always brags that its own democracy is a ‘universal value’ and denies there is any other form of democracy,” notes the influential Communist Party journal “Seeking Truth”, or Qiushi. Citing violence and political turmoil in countries like Libya, Afghanistan, Egypt and Iraq, all of which have conducted recent experiments with democratisation, the truth-seeking journal insists that, “Western democracy” never suited all countries. As the Hong Kong protests recede, I hope that this is not the end for the movement and the push towards legitimate freedom, writes Jo Walker. The implication of such talk is clear: China’s own system of “socialism with Chinese characteristics” is the best way to govern the world’s most populous nation, the most effective way of dealing not just with unrest in Tibet, Xinjiang and Hong Kong, but a form of one-party government that can lift all citizens of China towards dignity, amidst plenitude. This way of thinking about democracy naturally rounds on every public effort by citizens to carve out spaces that enjoy independence from the octopoid Party apparatus. What we are seeing clearly in this developing Hong Kong crisis is that monitory democracy or what Chinese citizens call jiān dū shì mínzhǔ – free and fair elections plus open public scrutiny and restraint of power, wherever it is exercised – is anathema to the Chinese Communist Party leadership. Their heavy-handed but often subtle media campaign against the umbrella uprising is living proof that they not only dislike monitory democracy. For understandable reasons, they fear it. According to the CCP counter narrative, itself backed up by heavy censorship of all independent reports on the unfolding crisis in Hong Kong, the uprising is not really a demand for democracy at all. It is (the stock phrases are commonplace) a dangerous conspiracy against the national interest, an assault on the dignity of the state, a threat to social stability, and a violation of the sovereignty and territorial integrity of the People’s Republic of China. During the past several weeks, news websites have been instructed to republish “open letters” lambasting protest organisers and warning that “Western democracy is no panacea”. A column in the Communist Party mouthpiece, People’s Daily, dubs the Hong Kong protests a form of “anti-democracy” led by a minority of people who are ruining the public interest for their own selfish political views, so trampling all over the basic principle of democracy that the whole people are sovereign. Commentaries published on the State Council Information Office blast the protest organisers for using “populism” to seduce young people, and for failing to see that “street politics” will never succeed in altering the bottom line: loyalty to the state. CCTV meanwhile tries to discredit the umbrella uprising by using infographics that portray it as “an illegal gathering” backed by “foreign forces”, principally the United States. The same slant is surfacing in the extensive media coverage being given to vice premier Wang Yang, who warns during his current visit to Russia that Western countries are plotting a “colour revolution” in China. If nearly 1.4 billion people in mainland China are benefiting from the world’s best society … then why not share it with Hong Kong’s seven million and Taiwan’s 23 million residents, instead of letting them suffer in the capitalist world under the ‘one country, two systems’ principle? Good question! Another satirist with practical intentions notes that if Hong Kong carries on “disobeying central government and disturbing social disorder” then Beijing “could simply cut its water supply, leaving them to drink sea-water”. Good suggestion! Disapproving censors have been lightning fast in their response. Sensitive keywords and phrases on social media platforms such as Sina Weibo and WeChat are currently blocked. Occupy, open umbrella, umbrella revolution, central government, student leaders are among the words on the hit list. So are “stand” (站 zhàn), a word that sounds the same as “occupy” (占 zhàn). Even references to Xi Jinping as “Master Xi” (主习 zhǔ Xí) are forbidden, simply because the phrase, which sounds the same as “chairman” (主席 zhǔxí), conjures memories of Mao. What is the significance of this state-produced propaganda? To what extent are mainland Chinese citizens aware of the Hong Kong umbrella uprising? Is there much sympathy for the umbrella protesters’ main demand (that Hong Kong citizens be granted the right to free and fair elections, and a different way of life)? Or do Chinese citizens mainly blame students, radicals or foreign governments for the disorder, in support of the official view? The answers to such questions are unclear. Gauging “public opinion” is notoriously difficult in China, where open public communication on sensitive topics is typically restricted. Whether, and to what extent, Chinese citizens believe the official stories is unknown. In any case, whether or not they believe this or that may well be beside the point, simply because, as Václav Havel long ago pointed out in his masterful essay The Power of the Powerless, the prime function of the language of Party officialdom is to silence its opponents, to frame ways of seeing the world by excluding alternative narratives. When seen in this way, the terms used by Chinese Communist Party-controlled media do in fact become part of the everyday language that Chinese citizens use to discuss and understand social and political issues. But whether or to what extent they believe the official language invented by party propagandists is not entirely relevant. For the main aim of the propagandists is to remind the population who is in charge, to circulate through their daily lives a whole vocabulary through which they are supposed to make sense of the wider world, to smother them under a canopy of deadening silence, to force them to shut their mouths, and to keep their heads down. Which helps to explain why the umbrella uprising in Hong Kong happened in the first place, why in recent days its supporters have built bamboo barricades, and why they are now desperately fending off police armed with guns and power tools, backed up by masked men working in tandem with taxi drivers and truckers convinced democracy is a dying Western ideal. John Keane is director of the Sydney Democracy Network and Professor of Politics at the University of Sydney. View his full profile here.